Preheat the oven to 150ºC, gas mark 2. Mix the fi rst 4 ingredients in a bowl. Warm the oil and honey in a pan until blended, pour over the dry ingredients and mix well. Spread over the base of a large roasting tin and bake for 30–35 minutes, stirring occasionally until crisp and pale golden. Leave to cool, then crumble and set aside. Put the fruit in a pan with the sugar and spices. Heat gently until the juices run, then simmer for 5 minutes. Remove the spices and leave to cool. 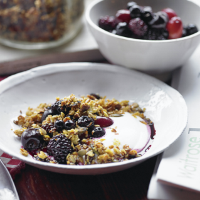 Serve the muesli and compote with the yogurt. This recipe was first published in Thu Dec 16 17:00:09 GMT 2010.